This is the V-stitch pattern that can be used to make many things: the thread size and needle size will determine the size of the finished project. Using small thread (ie: Cebelia or #10 cotton) will make lovely doilies that can be edged with a shell border or any border you like. Ch 3 at beginning and end of each row counts as first dc throughout this pattern. Row 1: Dc in 4th ch from hook, skip next ch, (dc, ch 2, dc) in next chain [first V-Stitch made. This is the V-Stitch used throughout this pattern], *(skip 2 ch, V-stitch in next ch)* Continue in the skip 2 ch, V-stitch in next ch pattern across length of chain ending with V-stitch in 3rd to last chain stitch. Skip next ch st, dc in last ch st. Ch 3, turn. Row 2: V-stitch in ch 2 space of each V-stitch across, dc in top of beginning ch3 st, ch3, turn. Row 3: V-stitch in ch2 sp of each V-stitch across, dc in top of ch3, ch3 and turn. Repeat Row 3 until desired length. My afghan is 45″ x 92″ You can make your color changes as often as you like or make it all one color if you prefer single color afghans. As I said, this is a very simple pattern and easily adaptable for whatever project you might like to do. Very pretty afghan. I love using the V-stitch pattern. works up lovely and is very adaptable. Homespun yarn is nice, but somewhat difficult to use. I find it hard to see the stitches. Maybe my eyes are just going bad…lol, but perhaps I’ll try this pattern with a larger crochet hook than what you used. 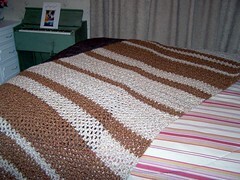 Although the yarn is expensive and makes for a pricey afghan, would make a wonderful gift. Thanks so much, Redd. I’m glad you like the afghan. And, yes, it does make a wonderful gift. Unless I missed it, Redd, there isn’t a border! I have been searching for hours for just ONE V-Stitch Afghan with a border. I MUST say, your afghan is the prettiest that I’ve seen! If you have a border that you have laying around…e-mail it to me. I don’t care what it would cost…! I’ve learn several just right stuff here. Certainly price bookmarking for revisiting. I surprise how much attempt you put to create any such excellent informative website. I love this pattern, thank you so much! I am about 50 rows in, alternating Caron Rose and Off White – 20 rows/5 rows – and it is beautiful. Thanks again for a great pattern! Would love to learn to crochet. I really want to crochet a poncho!! I made this pattern for my now ex husband and wanted to make one for myself. THANK YOU SOOOO MUCH FOR HELPING ME FIND IT AGAIN. YOUR AWESOME. Are we repeating row 3 to desired length? Is row 3 repeated to desired length? Janet… Since you wrote recently, reading responses, it looks like no one has been answering or commenting in response for awhile. If You don’t mind my saying so, from my ‘hundreds of years of reading patterns’ I’d say yes, go with Row three to desired length. I’m working on this pattern in a smaller size, to make a scarf. I love the pattern — it’s easy to play round with to make different sized projects. My scarf is made with two strands of Caron Simply Soft yearn, one of Soft Pink, the other of Off White. It’s working up beautifully! How do you do the edging?